Their discussion covered the nuts and bolts of CRE Collaborative and why it was founded, how technology has changed the CRE industry, and how the industry has remained in many ways the same despite all these technological innovations. You can also check out QuantumListing’s recent webinars with #DNA of CRE’s Linda Day Harrison and Ewa Baska and Leavitt Digital CEO Brendan Hotchkiss. Why do we need more collaboration in CRE tech? Andreas and David began the webinar discussing Andreas’ motivations for making CRE Collaborative. Commercial Real Estate has seen a proliferation of technological point solutions to solve different business needs over the past few years. There are sites like QuantumListing for posting listings, Leavitt Digital for getting those listings in the news, Buildout for marketing listings, and many more for all kinds of things to make the lives of real estate professionals easier. Right now there are over 5,000 tech solutions servicing commercial real estate through Proptech and CRETech, Andreas mentioned. While no one is using all 5,000, many in the industry are using quite a few. If all those solutions are disconnected, it makes a lot of “desolate data,” information that’s siloed in one platform even if it’d be useful in another. To overcome data desolation, it often means spending a lot of time porting data between platforms. And because brokers are busy, and over 90% of brokerages don’t have dedicated data management staff, data remains desolate. CRE Collaborative lets you push and pull data between the technology solutions you’re already using by integrating with these platforms. Once integrated with a platform, CRE Collaborative standardizes the data and makes it transferable between platforms. That means no more wasted time entering the same data over and over again. CRE Collaborative also makes it easy to find new tech that could help your business. It provides a consulting service in which CRE Collaborative looks at a business’ tech toolkit and provides recommendations on how to improve it. Andreas walked viewers through a demo of CRE Collaborative and showed viewers how it’s easy and straightforward to use. Users can join CRE Collaborative for free and access the Public Portal of user listings. And for only $59/user/month, paying members can use CRE Collaborative to bring all their desolate data on a single integration platform and create a unified data landscape for their businesses. After running through CRE Collaborative, Andreas and David’s conversation turned to how tech continues to shape CRE, and how certain parts of the industry will remain the same regardless of technological innovation. “Technology is a big differentiator because it can help get you in front of the right people and make sure you know the answers to the right questions,” Andreas added. All communication technology helps in this regard, from phones, to fax, to email, but we’re starting to see a new class of technology that can make communication not just faster but smarter. Artificial Intelligence will grow to become increasingly important in making businesses make decisions more, well, intelligently. There are already some examples on the market, like Digsy.ai, a real estate CRM that uses AI to give brokers actionable information about how to better generate and pursue leads. CRE Collaborative will also soon be rolling out AI features of its own to optimize its value for users. Right now machine learning algorithms are running on the site to gather and learn about the site’s data and inform the AI. Users can expect the CRE Collaborative AI to roll out some time next year. 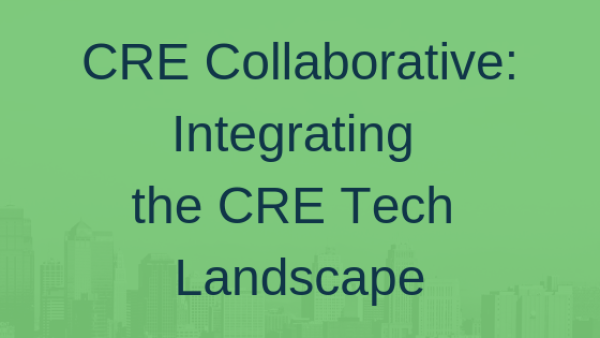 You can watch the webinar below to learn all about CRE Collaborative and the future of collaboration in CRE tech.